We provide Guaranteed Not-To-Exceed Estimates meaning you won't pay more then what we quoted you. Also, if we do it under what was projected on your quote you pay less. We are very confident in our estimates and our teams to deliver what is expected every time. Owner called day before moving day to verify date and time of arrival. Movers arrived on time and were very polite and attentive to our concerns. Did a fast excellent job of getting our 3 bedroom house in storage. Would recommend them for your move. This was the third move with the NewView Moving Company. All moves were done by a great team and good leadership. They were on time and stayed within our budget. I strongly recommend them for your move. Price was great and fast courteous movers. The guys were accommodating with which area of the house to place items. I will use this group again if need be. I had only one item that got some stain rubbed off but not bad for the move of a household. I just moved to North Carolina from Mesa, Arizona. 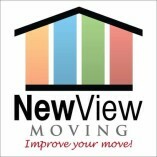 I used NewView Moving to help load my 26' Penske truck. Let me tell you these guys are beast... Strength, work ethic, ability, knowledge.... top notch! These two men loaded my truck from my two story home in just under 2.5 hours. I don't want to bad mouth the guys I just had unload me into my 1 story home in North Carolina because they were nice enough guys but just for comparison it took them 4 hours to unload which I thought was supposed to be faster. If you want the best make sure you give these guys a call.